A glory in spring and one of the most beautiful native American trees, the Cloud 9 Flowering Dogwood is an improved form of the wild tree, with larger, fuller flowers and greater resistance to cold. In fact, if you garden in Zone 5, this is the pick of the flowering dogwoods, surviving and flowering in colder conditions than any other. Not only are its flowers a dream, it has colorful red berries loved by birds and the leaves turn a beautiful rich red in fall. This is the perfect choice for a wooded garden, since it will thrive in the partial-shade of larger trees and will not be eaten by deer. The ideal tree for gardeners who want to grow native species. Small enough to fit into small gardens, as well as into limited spaces in big ones. Truly a tree for all seasons – you will never regret choosing this beauty. Spring is a wonderful time of the year, with its promise of a fresh beginning, so what could be better than to start that season with beauty in your garden too. 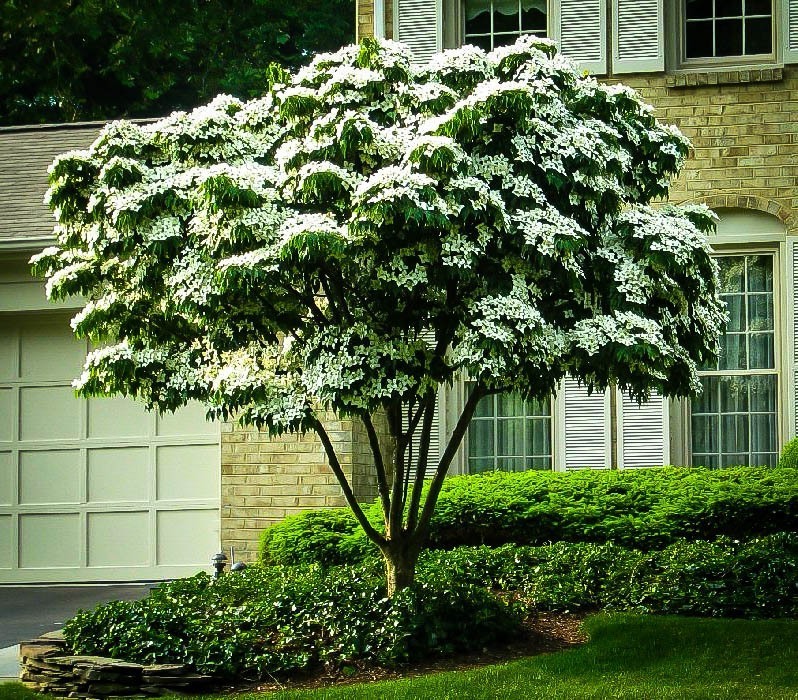 There is something fresh and new about a tree that is covered in pure white flowers and the White Kousa Dogwood does that in a spectacular way. 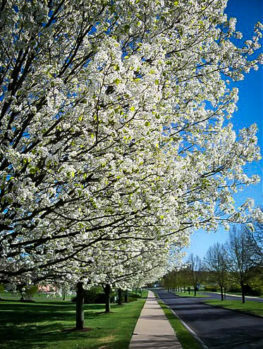 This tree grows 15 to 20 feet tall or more and has an attractive rounded shape that shows its beauty to best advantage. After the beautiful flowers, there is interest in the red fruits that are produced. In fall the leaves turn lovely shades of rich red, making this easy to grow and hardy tree an all-year-round beauty. It will grow in most areas and needs little or no pruning or special care. Each year it will become more beautiful and bring joy to you, your family and your neighbors, who will thank you for planting such a beautiful tree. 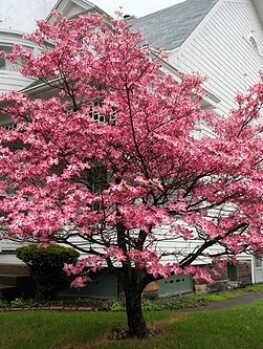 If you are looking for stronger color in a flowering Dogwood tree, the Pink Dogwood will fit the bill, with its rich pink flowers and similar appearance to the White Kousa Dogwood. If you have room they will look spectacular together. 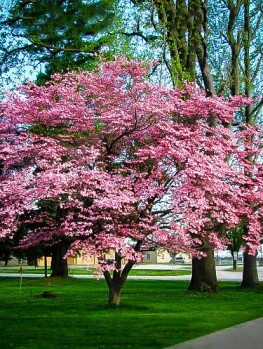 The White Kousa Dogwood is best planted as a specimen in the lawn or as a background tree. It looks especially beautiful at the edge of a wooded area, with taller trees behind it. 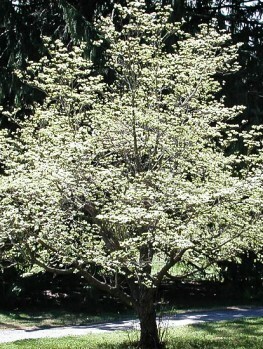 The White Kousa Dogwood grows into a small tree 15 to 30 feet tall and as much across. Young trees are vase-shaped, but as they mature they become rounded and full, often with several main stems and branches close to the ground. The dark-green leaves are oval and pointed towards the end. They are about 4 inches long and have characteristic deep, parallel veins. In fall the leaves turn a spectacular deep, rich red, making this tree an important part of the fall display in the garden. The flowers appear in spring as clusters all along the branches. The actual flowers are small, with greenish-yellow petals, but they are framed by four large white modified leaves, called by botanists ‘bracts’, which make the flowers, and the tree, very, very showy and attractive. The flower clusters are about 5 inches across. After flowering, a round fruit is formed that looks a little like a strawberry. These are about one inch across and turn red in fall. They are edible, with a pleasant taste and sweetness. They can even be made into wine, so if you like to grow unusual foods in your garden, this is certainly an unusual one to serve. Unlike its American cousin, which is susceptible to the deadly disease called ‘Dogwood Anthracnose’, the White Kousa Dogwood is disease resistant and has no significant pests. It is also rarely bothered by deer, so overall it is an easy, trouble-free plant that will beautify your garden every spring with a spectacular display. 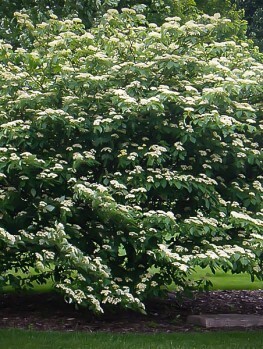 The White Kousa Dogwood should be planted in a sunny or partly shaded location. More shade is appreciated, especially from the afternoon sun, in hotter districts. The best soil is a sandy, well-drained one, with plenty of organic material added when planting. 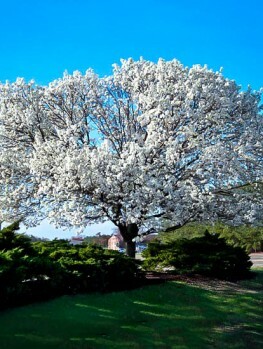 The tree is hardy from zone 5 to zone 8, so across much of the country this tree can be planted to grace any garden and put on a spectacular show every spring. Choose a sheltered location away from the possibility of winter salt-spray and a cooler, rather than hotter spot is best. 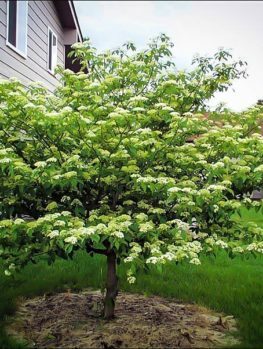 To plant your White Kousa Dogwood, dig plenty of rich organic material such as rotted manure, garden compost or rotted leaves, into the soil. Dig a hole three times the width of the pot your tree is in and plant at the same depth as it was in the pot. Replace most of the soil and firm it down around the roots. Add plenty of water and when it has all drained away replace the rest of the soil. Mulch the soil with a 2 to 5 inch layer of organic material and renew this each spring, spreading it wider each time to below the ends of the branches, as the tree grows. Keep the mulch a few inches away from the trunk. The tree has thin bark, so be careful when planting and working around your tree not to damage the bark with tools. Water your tree at least once a week during the first season and then do not allow the soil to become completely dry. The mulch will help retain moisture as well as control weeds and feed the tree. When watering, be sure to water the whole root-zone, not just near the trunk of your tree. Very little or no pruning is needed, just remove any crowded or rubbing branches and any lower branches if needed to make your plant more tree-like. This Dogwood (Cornus kousa) grows wild in China, Taiwan, Korea and Japan. 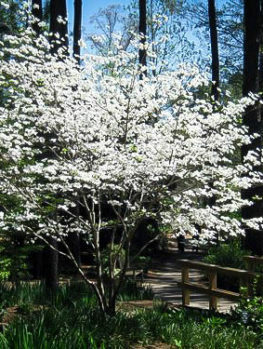 It is one of the Dogwoods called ‘flowering Dogwoods’ because they have large white ‘flowers’, making the plant very showy, especially compared to the smaller twiggy Dogwoods, which are grown for their beautiful stem colors rather than their flowers. The White Kousa Dogwood is closely related to the American species Cornus florida, usually called the Flowering Dogwood, which grows throughout the eastern states. 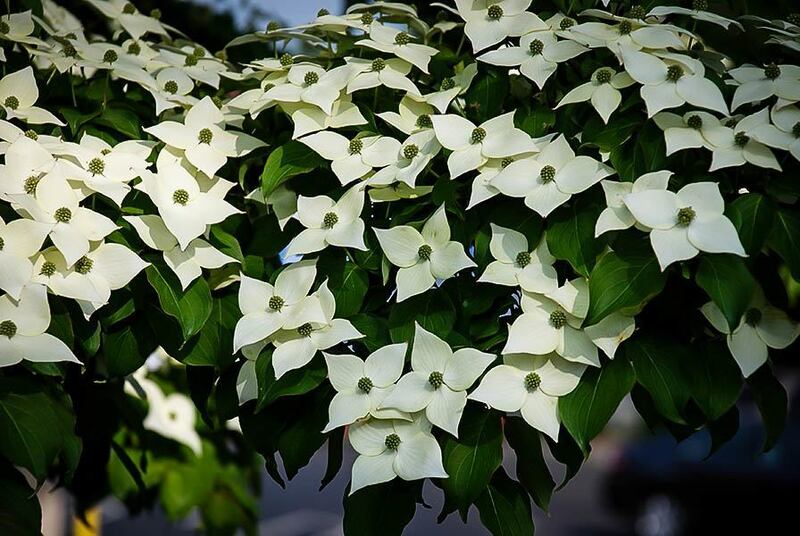 The White Kousa Dogwood is the preferred Flowering Dogwood as a garden plant because it is resistant to Anthracnose disease, which can kill other Flowering Dogwoods in some areas. It is also more cold-hardy, so it is the right choice for more northern gardens. Our White Kousa Dogwoods are true to the correct form and variety of this plant and we constantly receive new stock to ensure that our customers receive only the freshest material. However because of the popularity of this plant, supplies can be limited, so order your tree now to make sure that next spring you will have the first of many beautiful displays of flowers.